SYDNEY, Sept. 12, 2018 /PRNewswire/ -- Vivid Sydney is inviting Expressions of Interest (EOIs) from individuals and organisations across the global creative community to participate in the world's largest festival of light, music and ideas in 2019. Following the success of this year's festival, NSW Minister for Tourism and Major Events Adam Marshall announced EOIs have opened for Vivid Sydney 2019 across the pillars of Vivid Light and Vivid Music, and that Vivid Ideas will open soon. "Vivid Sydney brings together emerging and pioneering global creative innovators and this year attracted 2.25 million attendees from Australia and across the globe, generating more than $172 million for the NSW visitor economy," Mr Marshall said. "The Festival is a grand platform for out-of-the-box thinkers, artists, musicians, creative professionals, educators and businesses to showcase their talents to local and international audiences and I encourage everyone to submit their Expression of Interest and be part of this exceptional event." The Vivid Sydney EOI invites submissions across the Festival's three program pillars -- Light, Music and Ideas. Vivid Music features an extensive program of performance, multi-genre musical collaborations, and contemporary and experimental music at venues across Sydney, and includes the Vivid X|CELERATE program; a partnership with the City of Sydney which is devoted to celebrating Sydney's local musical talent by awarding grants and marketing support to venues, artists, and promoters with good ideas. Submissions are being sought from across the industry including music venues, producers, promoters, industry associations and innovators interested in being part of Vivid Music. Destination NSW Chief Executive Officer and Vivid Sydney Executive Producer Sandra Chipchase said, "Whether you're an industry innovator, aspiring creator or have a unique concept to share, this is a chance to be part of Australia's largest event. If you have what it takes to shape, market and present an installation, gig or event with interesting and innovative content, Vivid Sydney wants to hear from you." 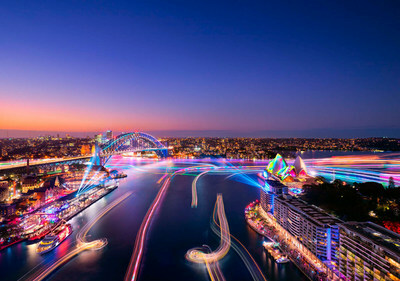 Vivid Sydney is owned, managed and produced by Destination NSW, the NSW Government's tourism and major events agency.